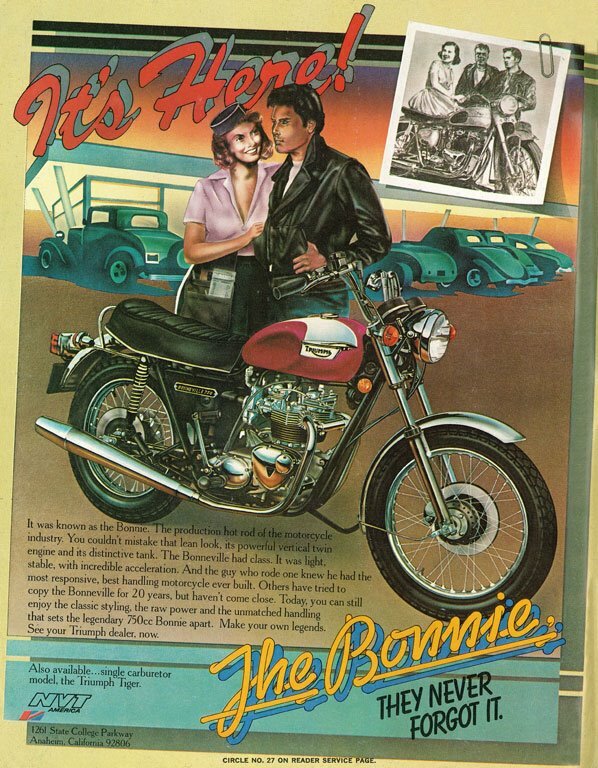 In an attempt to stir nostalgic values to the 750 Bonneville in the seventies here they advertise with sixties imagery, harking to diners and hot-rods, sunsets and black & white photo’s; the chinzy 80’s airbrush look detracts fom the bike, coloured to look like the ’68 zenith Bonnie. 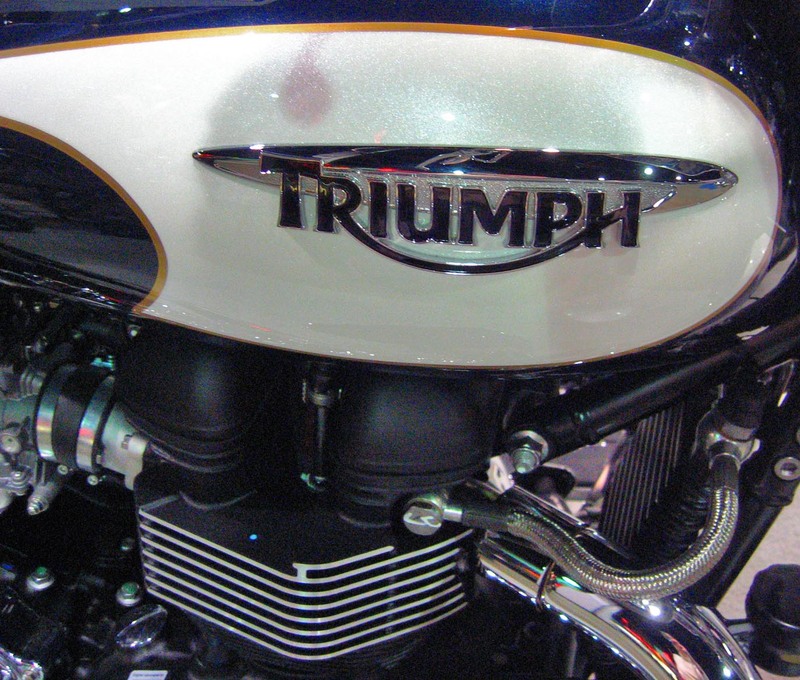 Note the NVT logo used for this Calirornian dealership (Norton Villiers Triumph); the conglomeration of the remnants of a once sucessful British motorcycle industry. 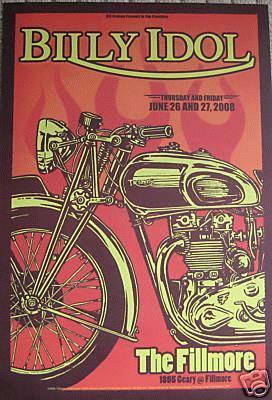 Punk Rocker Billy Idol, also a biker has used the triumph logo and a drawing of a twin for a concert poster. 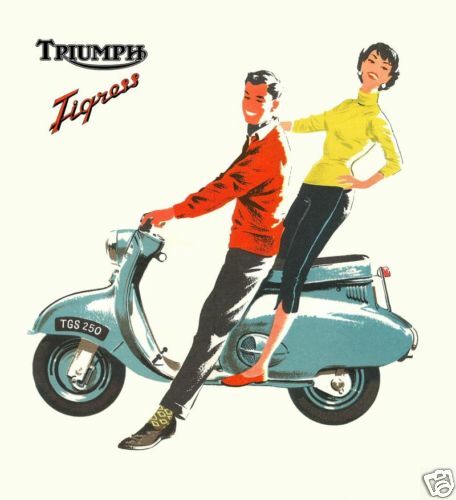 Triumph short foray into the world of the runabout included the four stroke 250cc Tigress and a year or two later the two stroke Tina; The artwork is enduringly 50’s. 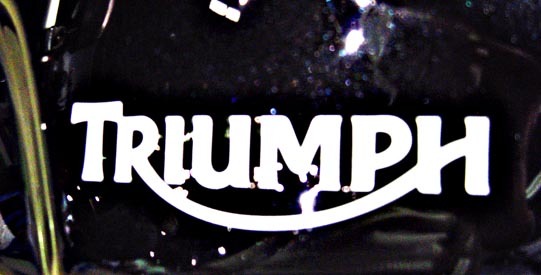 Just think about all those Mods and Rockers all on Triumphs! 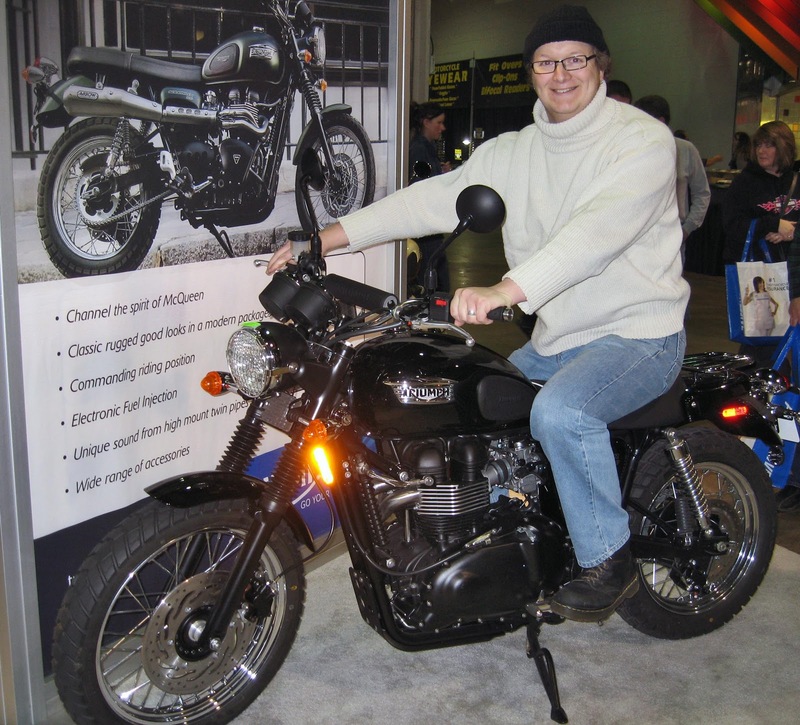 Triumph Motorcycles had a stand with their latest models this year (for the first time) at the International Motorcycle Show held at the Rosemont Convention Center. 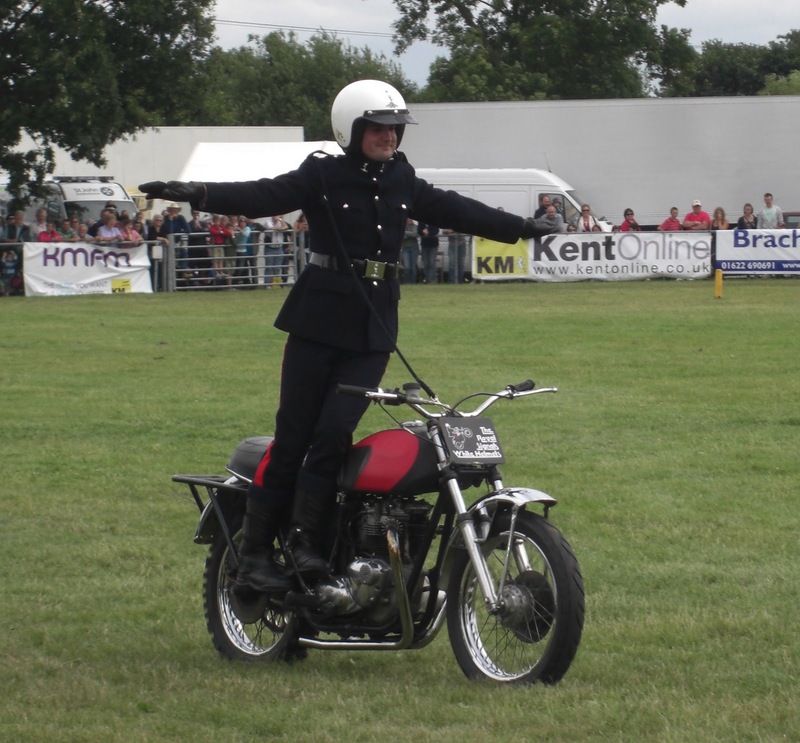 The Scrambler model is upright an comfortable. I’d take one of these please sir! 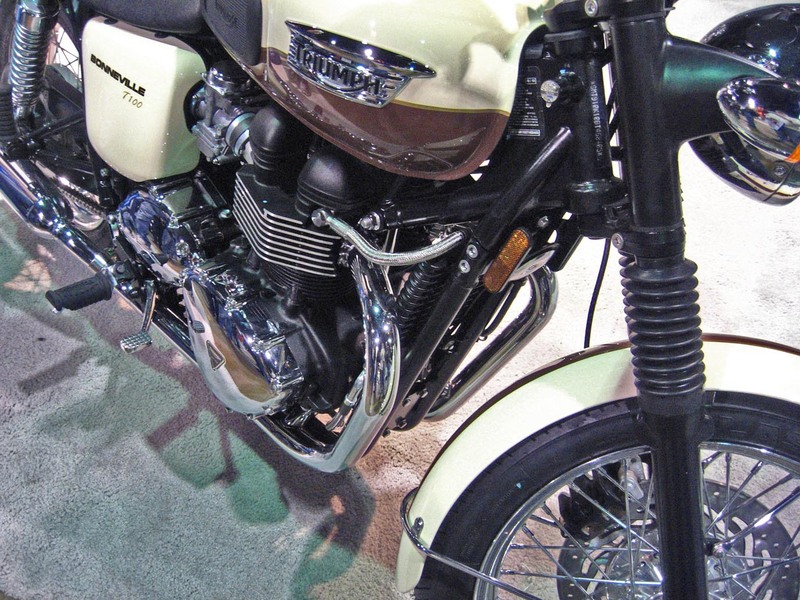 A coffee and cream T100 Bonneville harks to the sixites models. Sublime. 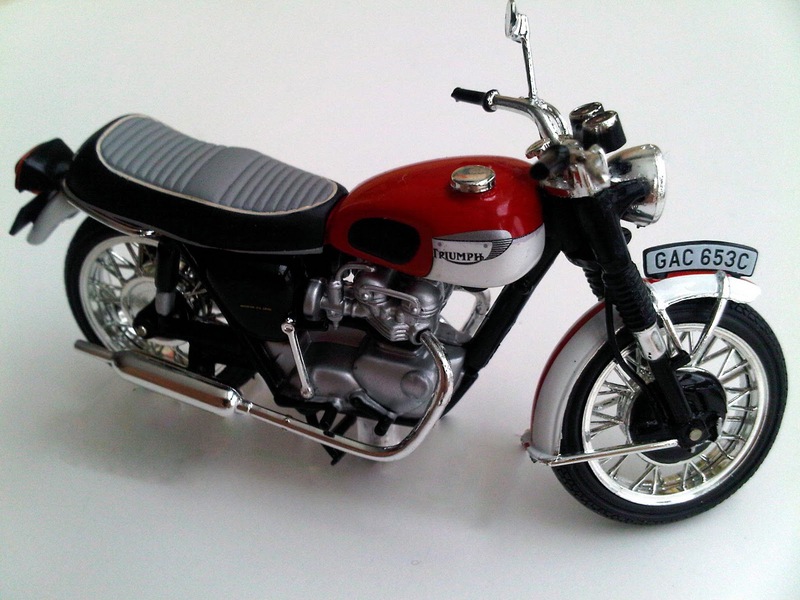 Whereas a T100 set up to look like the later 70’s model Bonnies with cast wheels looked superb also. 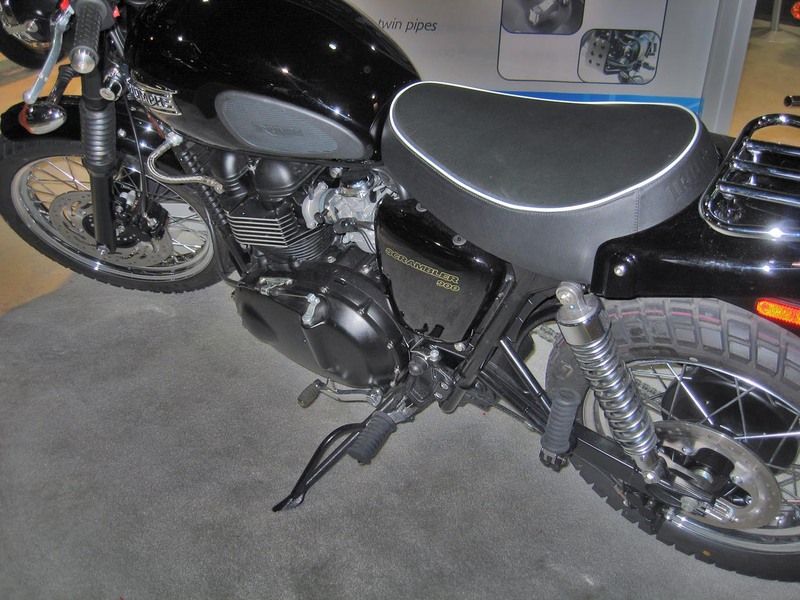 The chunky tires, single seat, rear rack give the scrambler a focus. 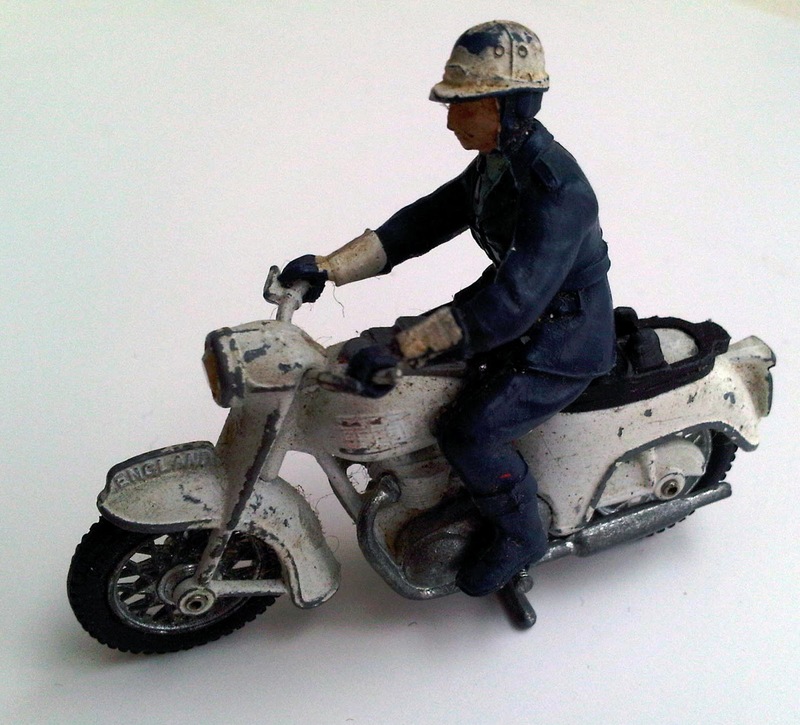 All I’d need is a Belstaff wax jacket and off I go! The Thruxton racer model is my favorite. 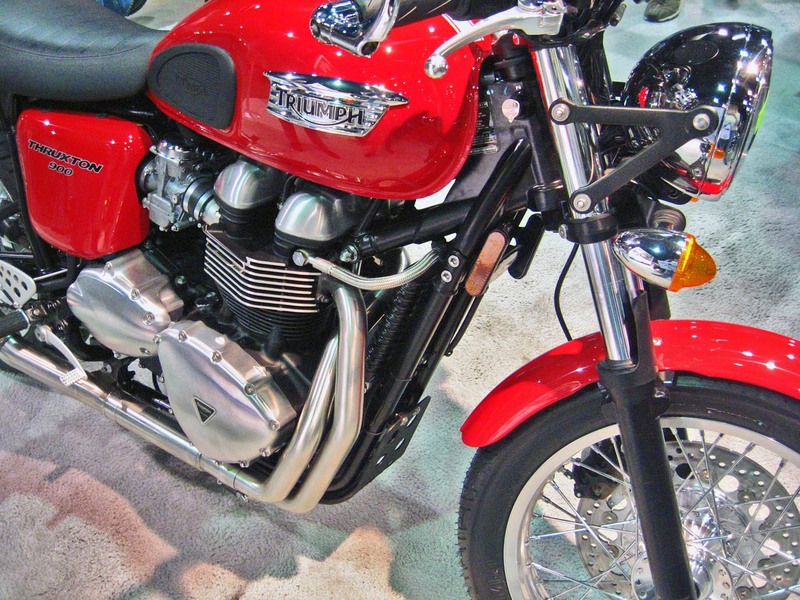 Drop bars, alloy rim wheels, rearsets and a stainless exhaust adorn a juicy red bike. I’d be at one with the road upon this steed. 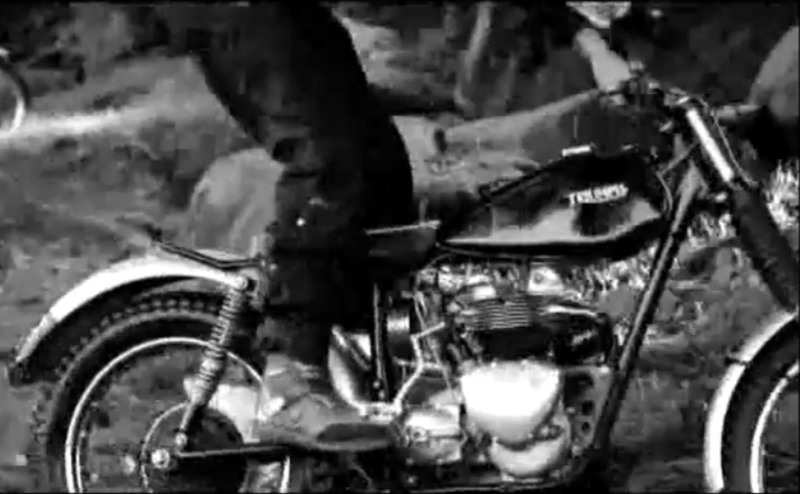 My ’72 Bonnie is going to be adapted to this style. 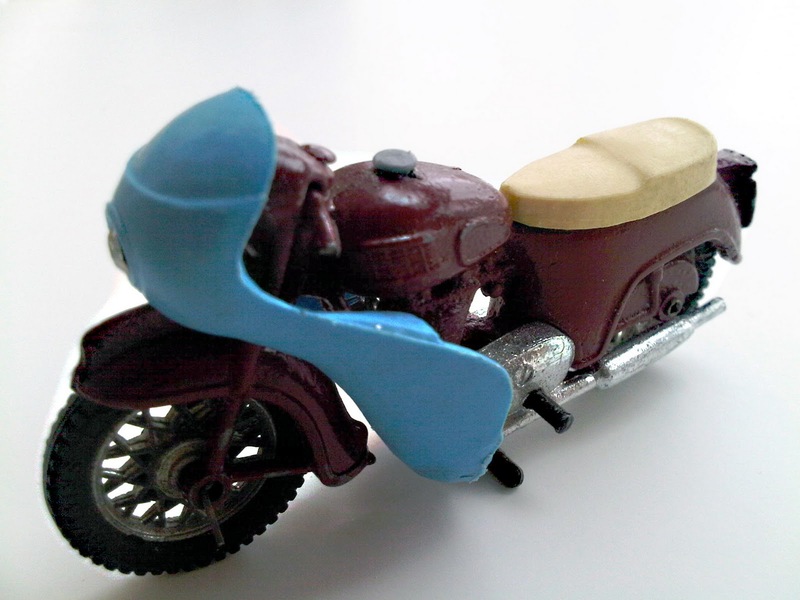 A police 5TA Speed Twin – with rear ‘bathtub’ fairing. Same Speed Twin 5TA Die-cast but this time a faired racer. 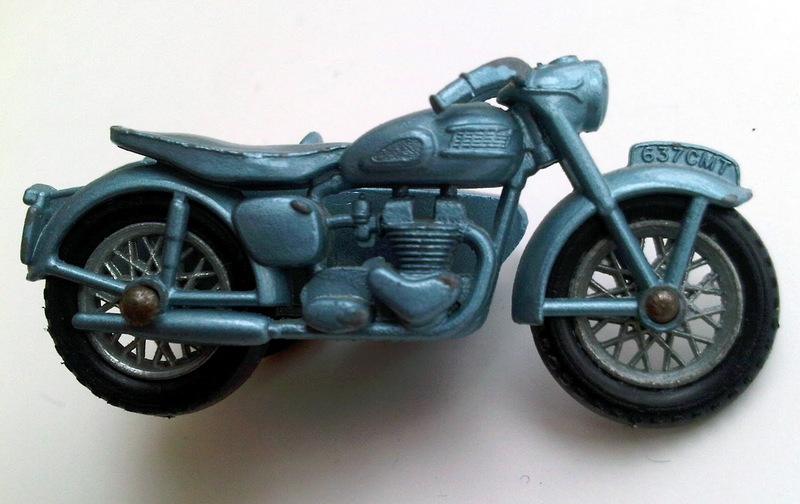 A Lesney Matchbox Triumph T110 with sidecar. Great detail of the pre-unit engine on the timing side. 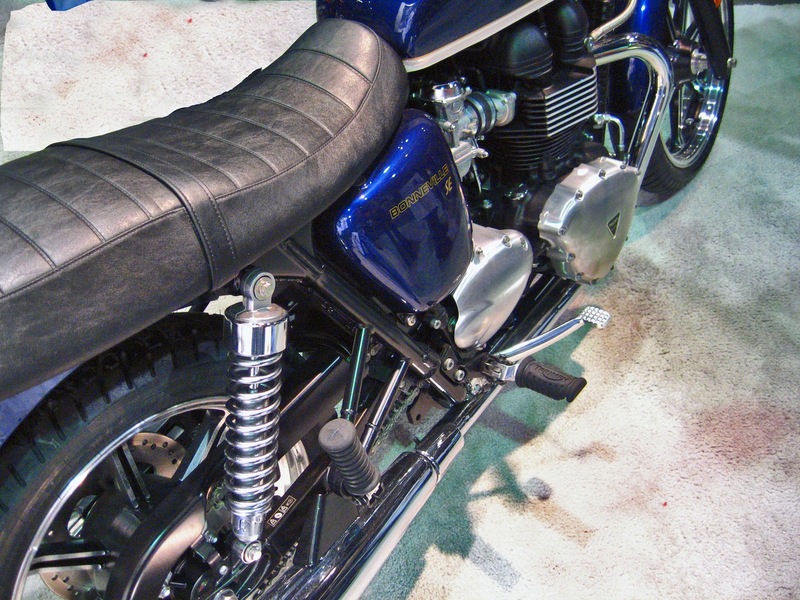 And finally a modern detailed Triumph Bonneville from Altaya. 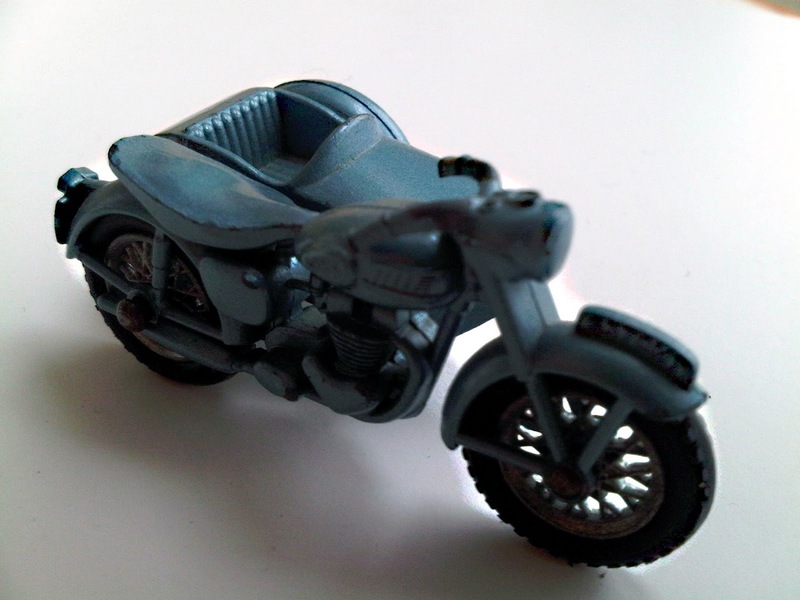 Good enough to ride! 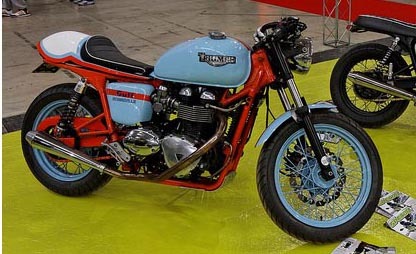 Here’s someones modern interpretation of the Bonnie in the sky blue and orage of the Gulf Oil racing colors (just like I want to achieve with my bike!) looks good, especially with the orange frame. The blue rims may be a little overkill, perhaps just black would be fine, but this does look like a cafe McQueen would be seen on! 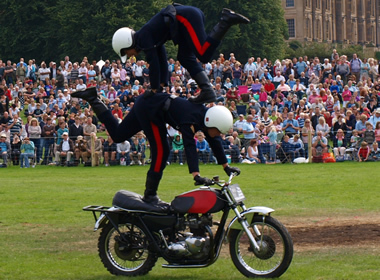 These guys are another early memory of motorcycling. 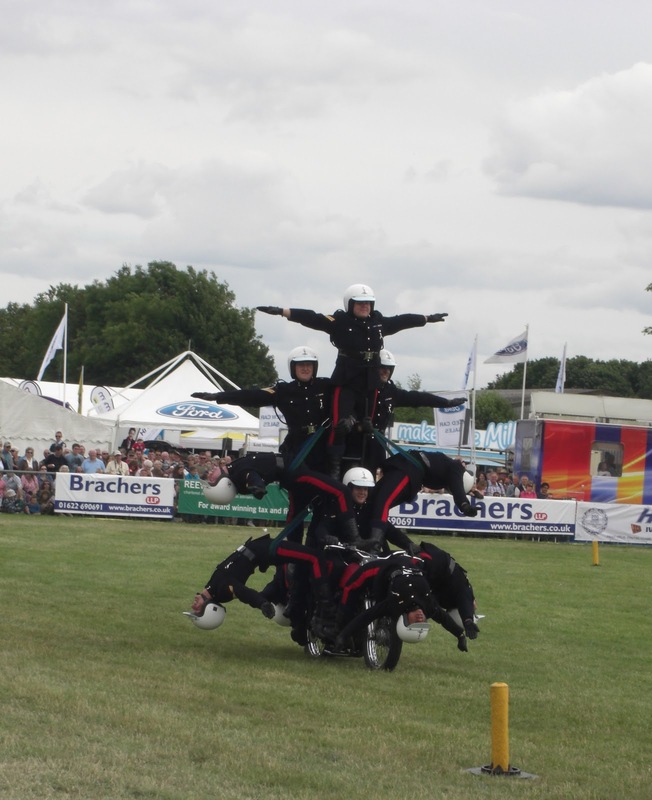 They would ride around arenas across the country, as well as at the Royal Tournament, in perfect syncronized fashion, either piled up on one bike, or through flaming hoops, or on one great feat, ride towards each other in a X-shape just missing each other by fractions of an inch. 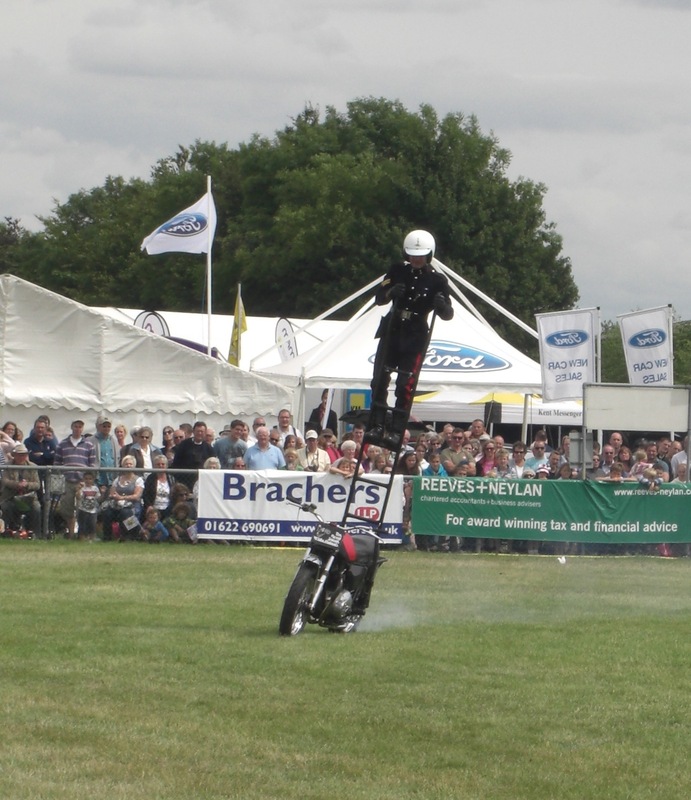 Bike skills and control are superb. 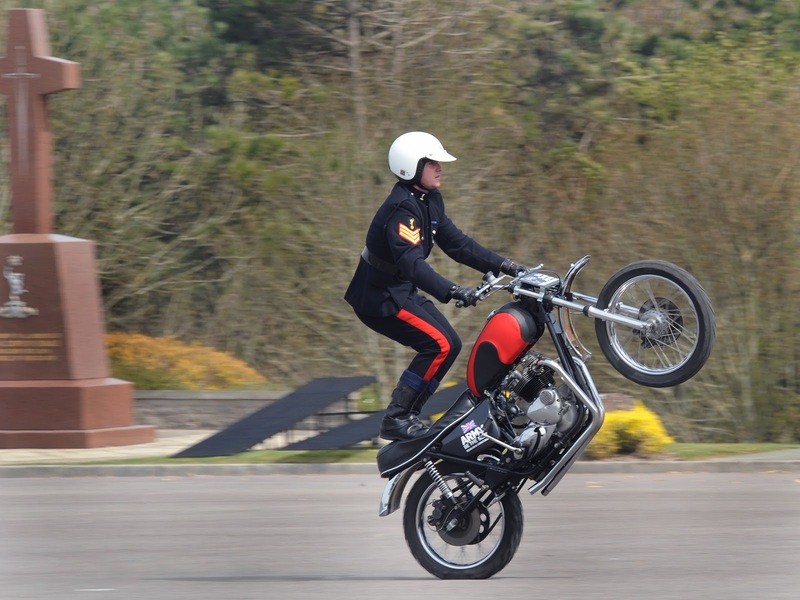 They are a volunteer team within the Signallers and are one of the oldest motorcycle display teams in the world. 80 years. 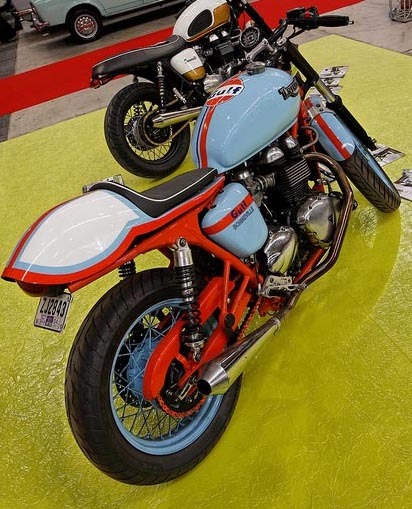 Their bike of choice: a 750 Triumph, with loud TT pipes, knobbly tires and a red flash’d tank to match their pistripe trousers. 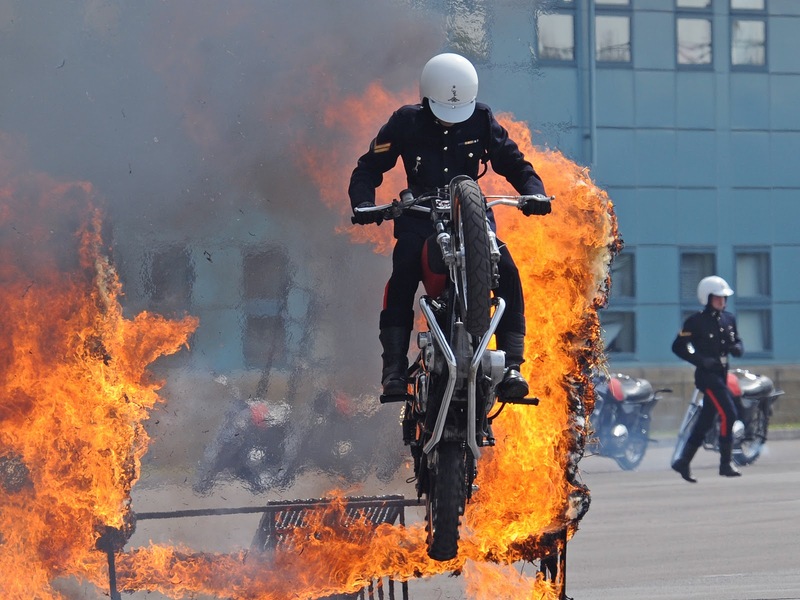 More tuned to their machines against the modern street stunt riders who rely on wheelies, burnouts and stoppies. 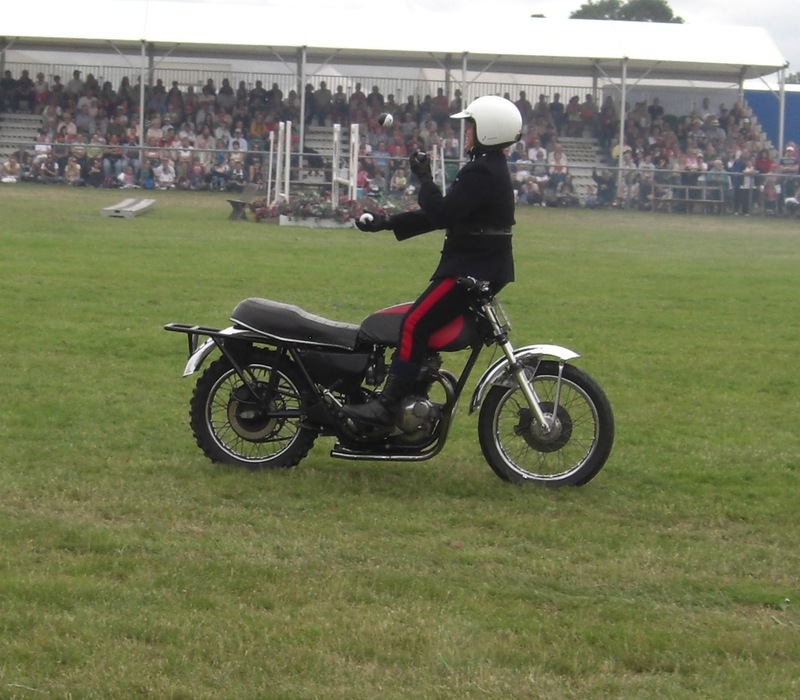 Sidesaddle standing with no hands, cool control. 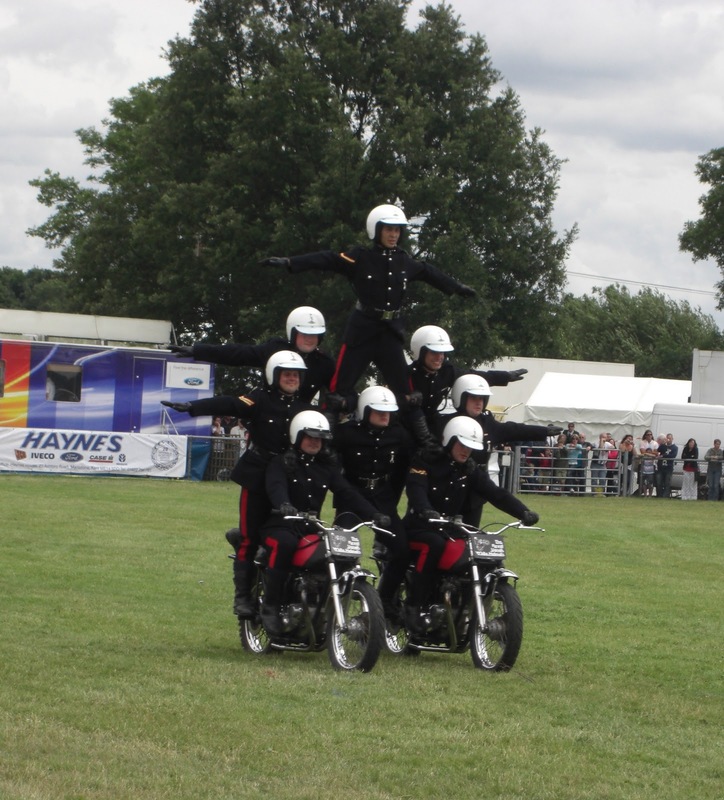 9 guys as well as the rider on one bike. Atop a ladder and riding around.